Probably the highest concentration of Seabuckthorn berry oil on the market today. Sea Buckthorn berry oil is a wonderful natural skin conditioning ingredient that will leave your skin smoother and softer, lessening redness, than ever before or take us up on our 30 day refund! 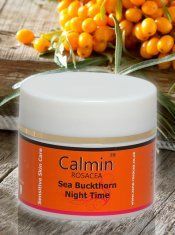 Calmin Night-Time, Intensive, Nourishing, Night cream with Seabuckthorn Berry Oil reputed to control Demodex Folliculorum a Mite active at night and thought to be a Rosacea trigger.